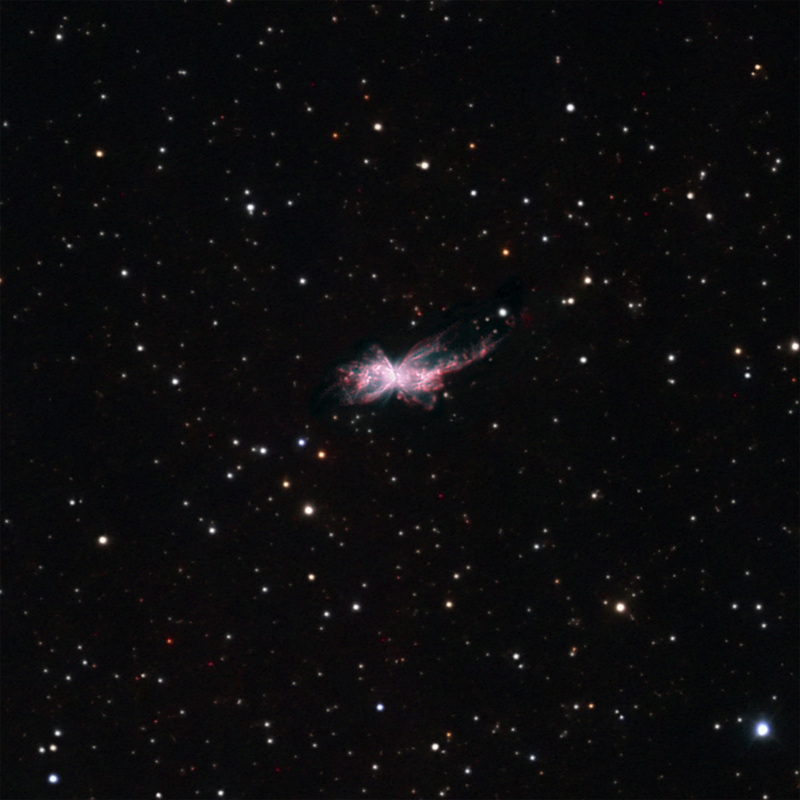 The Bug Nebula in Scorpius is a classical example of a bipolar planetary nebula (PN). This "butterfly" shape is not often seen in PN because of our line of sight, but is supposed to be quite common. We often look through the ends (e.g. Ring Nebula) or obliquely (Dumbbell Nebula). It is thought that strong solar winds come from an asymptotic red giant star (hydrogen and helium burning) and collide with a dense circustallar disk of dust and gas. For reasons still debated, the winds blow out on opposite sides of the disk into a taurus. The core in the asymptotic giant is made up of carbon and oxygen. In another million years, the star expands with a huge increase in luminosity. This is when this stellar wind devleops that eventually blows off the hydrogen envelop exposing the hot core. When all the hydrogen is burned up, this central star contracts and becomes a white dwarf (Cosmic Butterflies, S. Kwok, Cambridge Univ. Press, 2001, p47). Taken with Astrodon 5 nm H-a, 3 nm OIII. The image is cropped to ~16′ square and north is up.